The Mylo Stick is a slim closed pod system that takes nicotine salt pods for a super-satisfying vape. The Mylo Stick Starter Kit has been designed with absolute simplicity in mind. There are no buttons on the device, which keeps it as streamlined as possible: to use the Mylo Stick, simply pop in a pre-filled pod and inhale on the mouthpiece! At the other end of the kit is a USB connector that can be plugged directly into your USB port when the kit’s 400mAh battery needs charging, so there’s no need for charging cables. 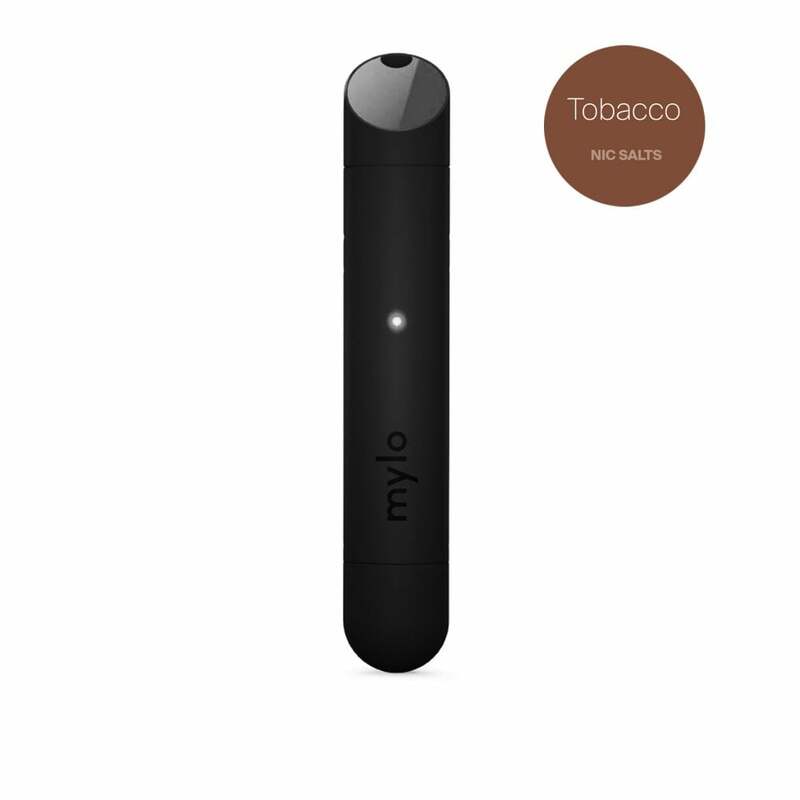 Utilising pre-filled pods, the Mylo Stick makes vaping as straightforward as possible. Each pod holds 2ml e-liquid and contains an organic cotton coil for rich, pure flavour with every inhale. Mylo pods use 18mg nicotine salt Ohm Brew e-liquid, which gives you a quick and ultra-satisfying rush of nicotine, coupled with a smooth throat hit; this is great for ex-smokers, as the experience of vaping nic salts is very reminiscent of a traditional cigarette. Mylo Stick pods come in a range of flavours so you’re sure to find something you like, whether you’re a tobacco traditionalist or keen to try something fruity, creamy or menthol-based. Each Mylo pod provides roughly 300 puffs. The Mylo Stick Starter Kit is a great option for beginners looking for a cigarette-style nicotine hit when they vape, or for more advanced vapers looking for a kit that prioritises convenience, portability and satisfaction. Don’t be fooled by the Mylo Stick’s minimalist design - it delivers an intense, flavour-filled vape paired with a quick nicotine kick! The vape is really smooth, and quite similar to smoke. The mouthpiece is comfortable. My favourite flavour is tobacco. Very good little device they made it quite simple and easy to use. I love the fact I can put juice in the device and the fact it allows you to charge it up. The little indication in the front is very handy. I like how there is many different ranges of flavours for this little device! I use the Blu Vape and as a smoker who "supplements" the craving I find that a great device. I bought this as another alternative but I find the draw on this harsh when it actually gives you a decent "drag" which most times you do not get until the 5th attempt and a blue face! Sorry but not impressed. Good Vape, really like the design very lightweight and feels great in the hand. Charging is super easy with a USB point at the bottom (no cables) Tobacco flavour is good. Unfortunately the Vape will occasionally get a little hot in the mouth and will crackle. the pods also leak a little but is not a problem and not noticeable until you have to swap pods. Like all these systems it loses a star because I cant use my own liquid.